Allura Red AC is an azo dye derived from petroleum. 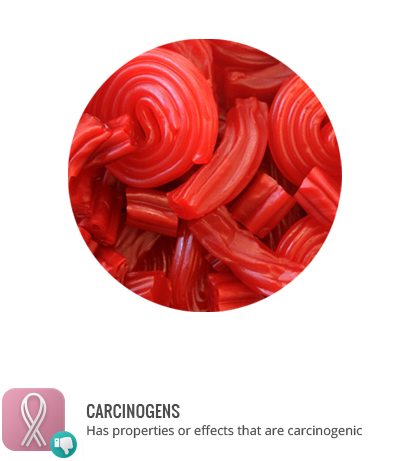 It is the most commonly used red food dye. Animal studies testing very high doses of Allura Red show no significant adverse effects. Recent studies have suggested that consumption of a mix of artificial dyes, including Allura Red, in combination with benzoates, a type of preservative, may lead to hyperactive behaviour in children. Studies where synthetic dies were eliminated from a child’s diet found nutrient deficiencies as, given the prevalence of synthetic dye usage, a large variety of foods had to be eliminated. This dye contains benzidene, a human and animal carcinogen. Allura Red usage is discouraged in Europe, and banned in Denmark, Belgium, France, and Switzerland.